THE Crewe Diesel Preservation Group’s No. 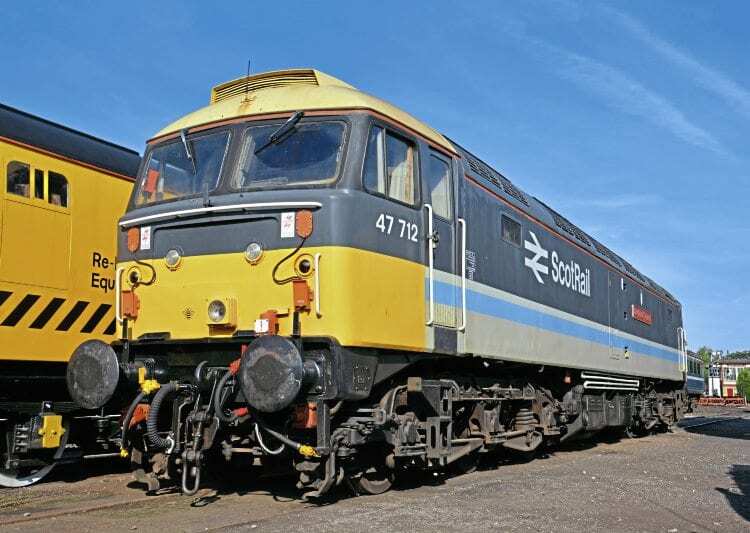 47712 Lady Diana Spencer is set to return to the main line during 2019 in a deal between the loco’s owners and Locomotive Services Ltd, which operates from the former Crewe Diesel Depot. The ‘47’ is currently based at the nearby Crewe Heritage Centre. The 18-month agreement between the two parties will see the ScotRail-liveried Brush Type 4 return to use on Network Rail, although it will be restricted to 75mph. This will ensure the loco is safeguarded and not used to the same extent as the other five operational Class 47s in the LSL fleet. It is likely to be used mainly on driver training and route learning duties. It will also be ideal for use as an ETS provider/shunt release loco on shorter steam-hauled tours. No. 47712 last ran on the main line in 2011 as part of the DRS fleet. It then became a ‘super shunter’ and train heating provider at Crewe LNWR until it was sold for preservation in 2013. It was restored in 1980s ScotRail colours and has become a popular guest loco at various galas. The loco regained its Lady Diana Spencer nameplates at a ceremony at the DRS Gresty Bridge Open Day in July 2016.